Tough feedback is just that . . . tough. And while we may not ever get to a point where we look forward to sharing difficult information, there are ways to make these conversations less difficult. The Proactive Approach to Difficult FeedbackOne of the biggest reasons tough feedback is so tough is that we realize what we are about to share will shock, disappoint, or even anger the recipient. However, if you think about it, it’s not necessarily the information that causes the shock, disappointment or anger, it’s the fact that the recipient never saw it coming. The difficult news seems to come out of the blue and completely contradict the recipient’s perception of the circumstances. · Clearly define and set the employee’s and your expectations up-front. People don’t go from stellar performers to substandard overnight and they definitely shouldn’t become aware of this fact for the first time at their annual review. Leadership development is ongoing and expectations should be clear and agreed upon up-front. Employees should know exactly what you expect from them, what they can expect from you, and what needs to be done to make improvements. · Give feedback throughout the year. Don’t just “save it up” for the formal review. Again, no one likes surprises, especially bad ones, so don’t keep people in the dark. If an employee has been reminded about a specific behavior issue eight times throughout the year and has failed to make an improvement, the performance downgrade will be less shocking (and less difficult to deliver) during the annual review. · Focus on the task and the expectations around the task – not the person. Give clear examples of actions that do not meet the expectation set. Feedback should not focus on personality, emotions, or even social styles. It’s about the task, behaviors and expectations. · Make a plan with dates to discuss and update expectations – and document it. Tough issues should be documented and managed throughout the year. Keep checking in with the employee to re-state and clarify both your expectations and his or hers. Keep an accurate understanding at all times about how you both feel the person is doing relative to developmental issues. This understanding can only happen if you schedule planned meetings throughout the year to review and discuss. Whether spoken or unspoken, expectations have a powerful impact on our thoughts, feelings, and actions. They play a key role in driving our attitudes. Research shows that employees who have clearly defined, well communicated expectations find more satisfaction and success in their work than people whose expectations remain unspoken and unrealized. · Am I serving this person by not being honest and up front about their performance? · Were the expectations explicitly stated to this person? Did he/she demonstrate understanding of the expectations? Was I proactive in communicating the expectations? What is my part in this? · What were the employee’s expectations about this development issue? Were they clearly stated to me? Did I demonstrate my understhanding of his/her expectations? Did our expectations of the developmental issue/opportunity match? · Did we communicate clearly and often about progress around the issue? The following model provides you with an effective process for creating and delivering difficult feedback. Try to include all four elements in your feedback to employees. B – Behavior: Identify what the employee is doing or not doing that is unacceptable. E – Effect: Explain why the behavior is unacceptable, how it hurts productivity/ business performance. E – Expectation: Explain what you expect the employee to do or not do to change. R – Result: Identify what will happen if the employee changes (positive tone) or what will be the consequences if the behavior continues (negative tone). 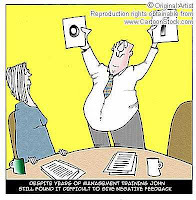 Believe it or not, the more you give feedback about uncomfortable issues, the less uncomfortable the sessions become. Tough issues do not have to mean tough feedback. Take a proactive, not a reactive, approach and you will help strengthen employee relations and head off many of those dreaded “sweaty palmed, sick stomach” discussions.